Solar panels, TV, petrol-powered coffee machine... the works! 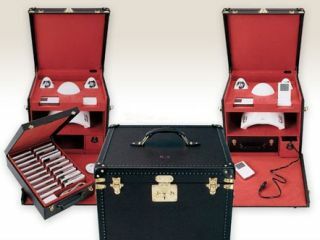 Karl Lagerfeld designed this Luis Vuitton high-tech trunk - with capacity for forty iPods... Just don't ask 'why'? Louis Vuitton one-ups the rest of the luggage world this week with the launch of a new 'uber' suitcase, containing a TV, coffee-machine and a host of gadgets powered by solar panels. The news comes via Register Hardware spotting a number of images of Vuitton's two new hi-tech suitcase. We expect to see the usual suspect celebs sporting these high-tech trunks in the pages of Heat and Closer sometime soon! One trunk that was specially commissioned for a Chinese customer and contains everything you really need to get you through life – notably a TV, a DVD player and a petrol-powered coffee maker. Plus a bunch of solar panels to charge up your iPod, laptop and any other gadget you care to take to the desert island with you. "It's worth noting that, when a simple Louis Vuitton passport holder costs £155 ($234/€176), the custom-made Lagerfeld trunk would undoubtedly set you back a pretty penny," notes El Reg. "Yet it comes with what looks suspiciously a JBL speaker set - which retails for around £50 ($75/€56). Nice mark-up if you can get it..."